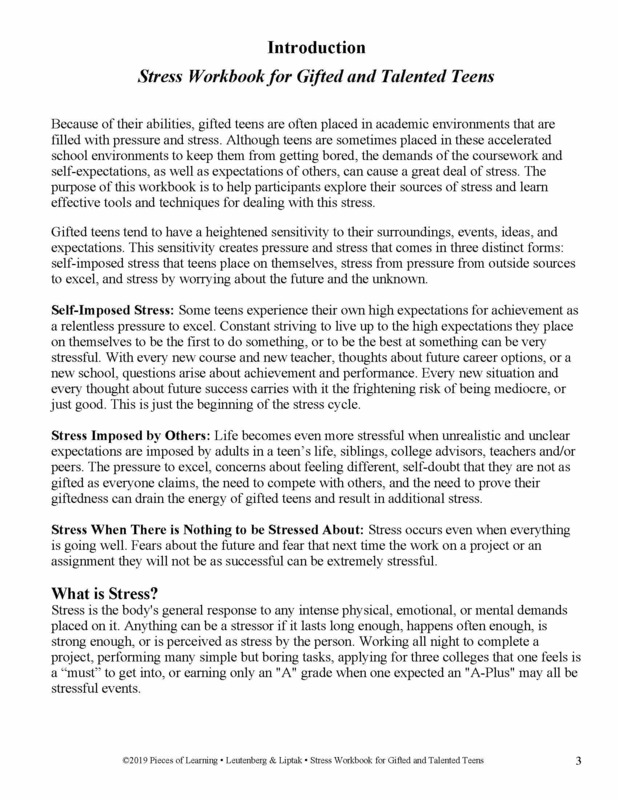 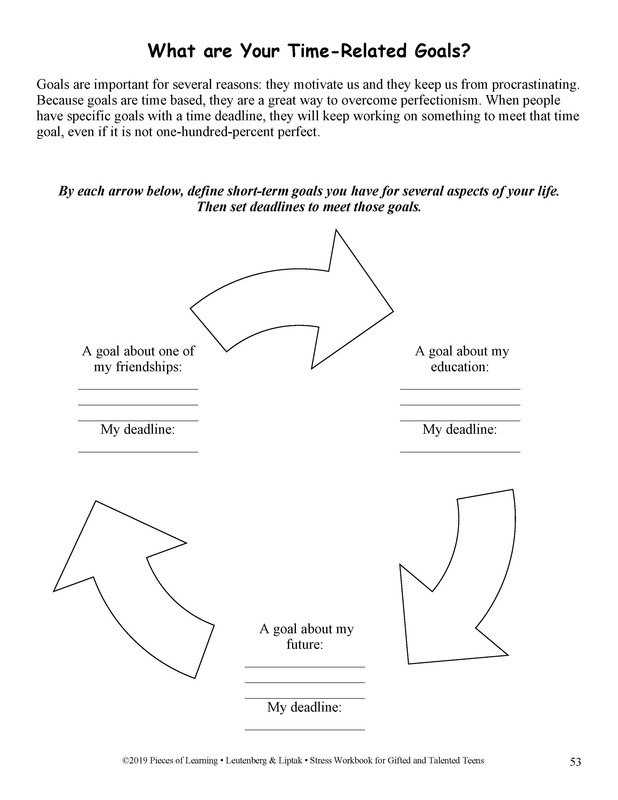 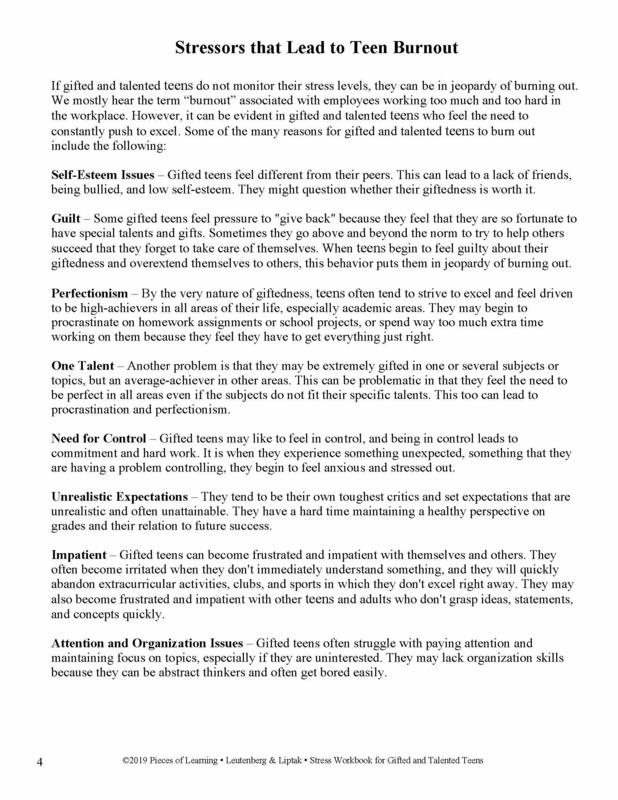 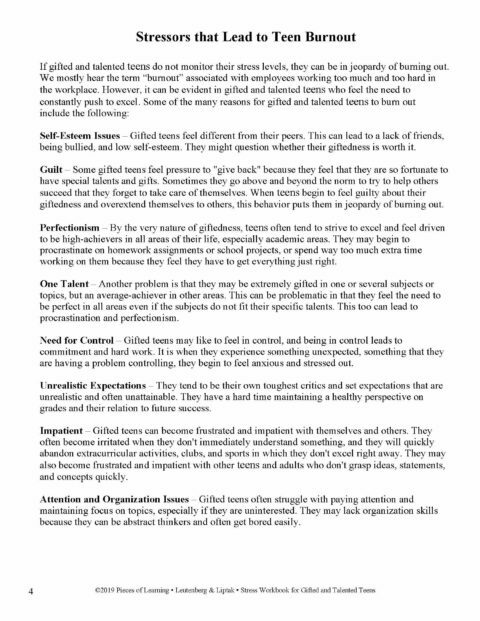 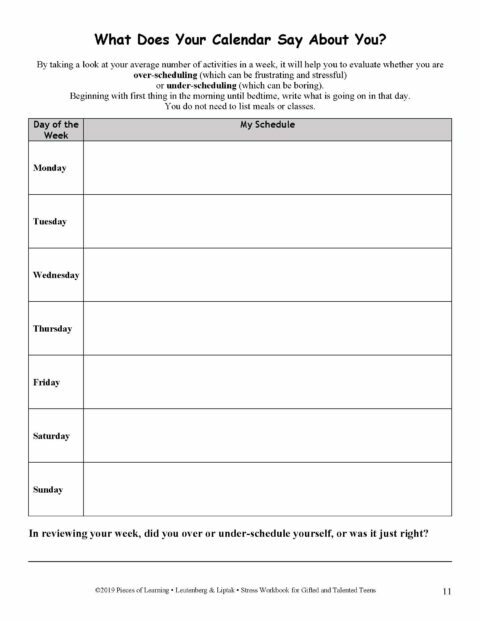 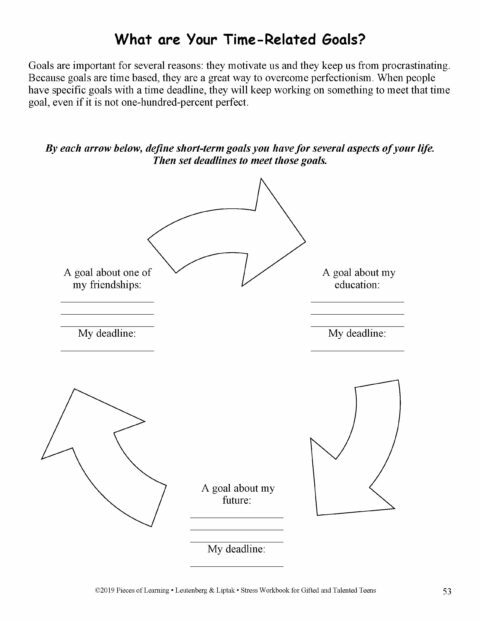 The Stress Workbook for Gifted and Talented Teens contains five separate modules of activity-based handouts that will help teens learn more about themselves while learning to cope more effectively with stress in their lives. 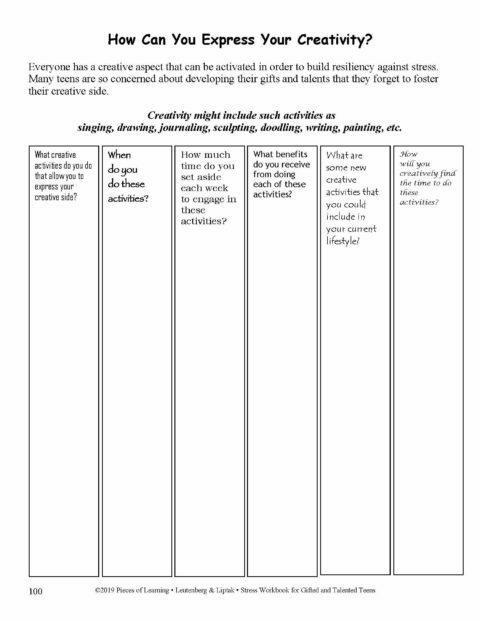 These modules serve as avenues for self-reflection and group experiences revolving around topics of importance. 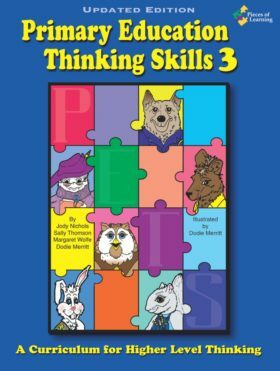 The activities in this workbook are user-friendly and varied to provide a comprehensive way of exploring, understanding, and dealing with a variety of stressors experienced by gifted and talented teens. 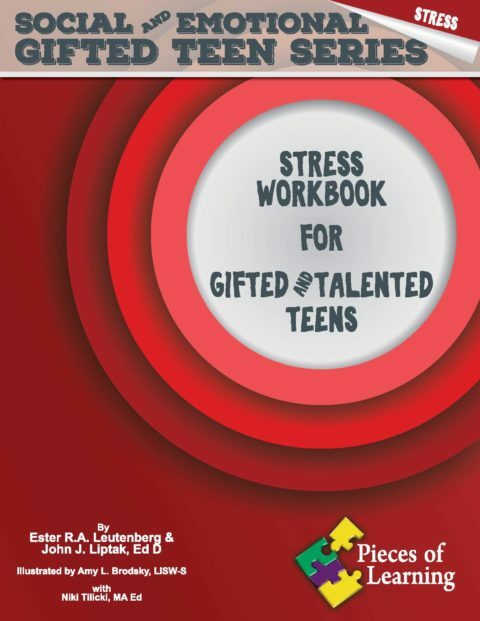 Stress… is the fourth book of our Social and Emotional Gifted Teen Series by authors Ester R.A. Leutenberg & John J. Liptak, Ed. 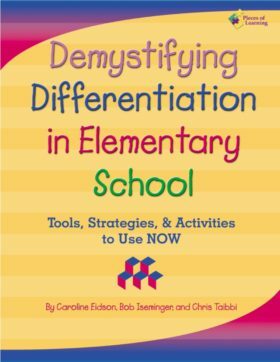 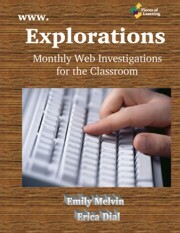 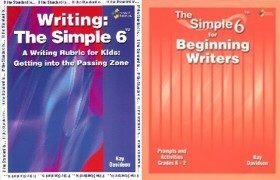 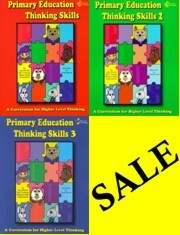 D.
Everything in this workbook is completely reproducible and can be photocopied and/or revised for direct student use. 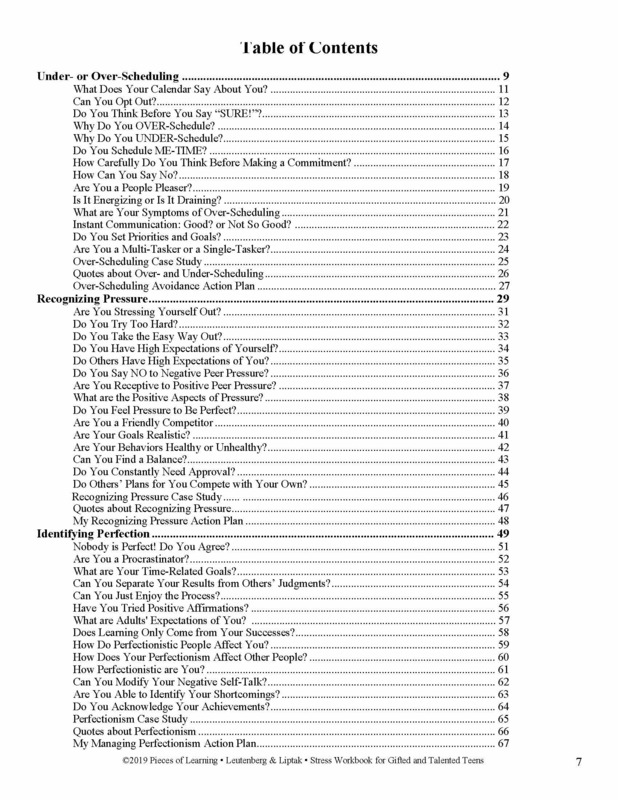 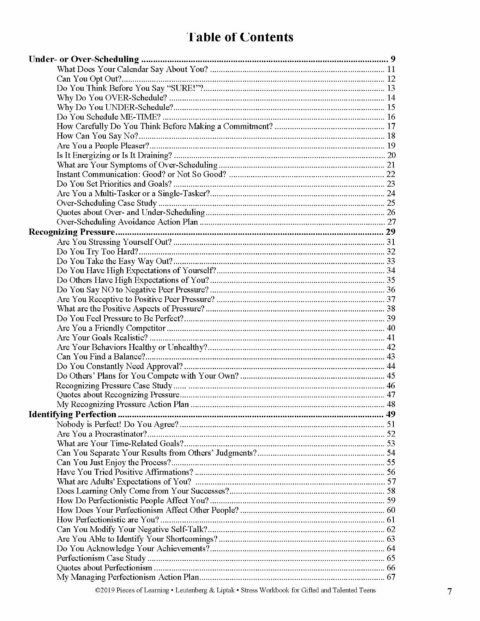 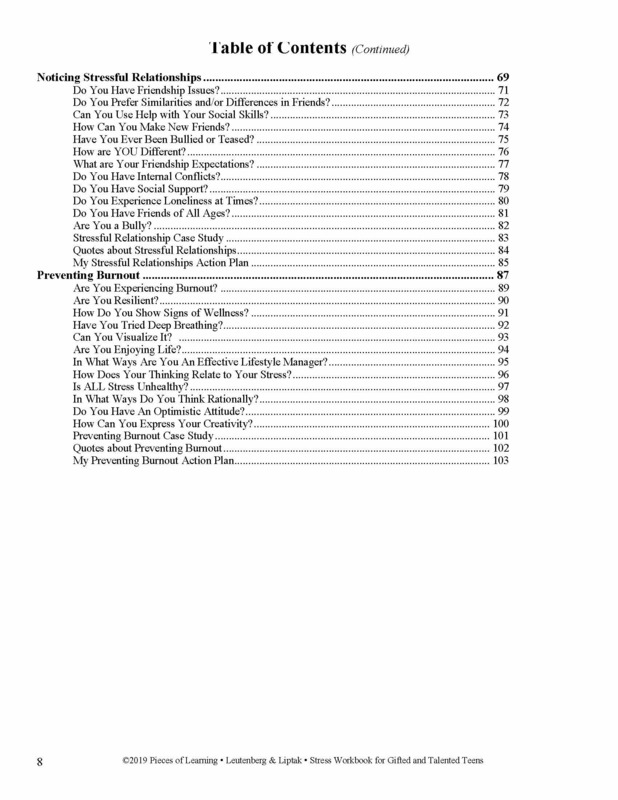 This workbook has been designed as a practical tool for teachers, counselors, and helping professionals. 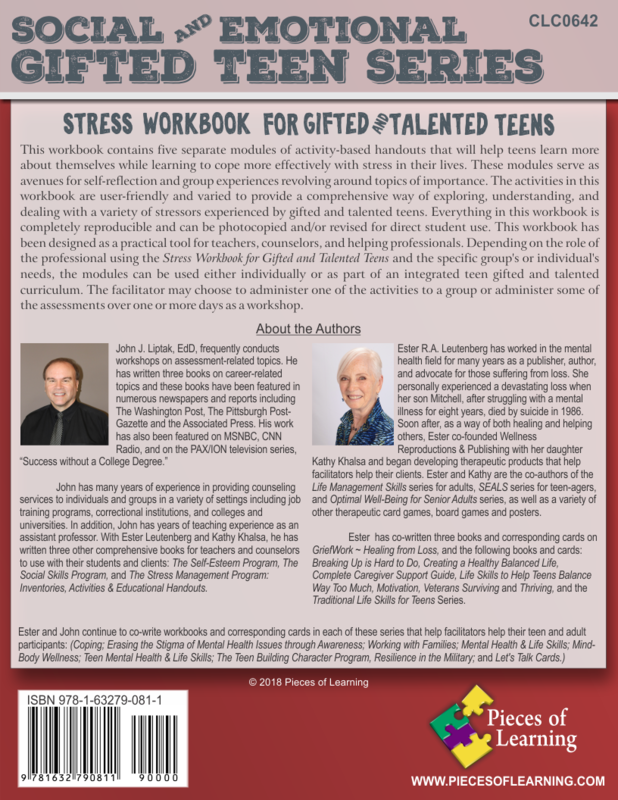 Depending on the role of the professional using the Stress Workbook for Gifted and Talented Teens and the specific group’s or individual’s needs, the modules can be used either individually or as part of an integrated teen gifted and talented curriculum. 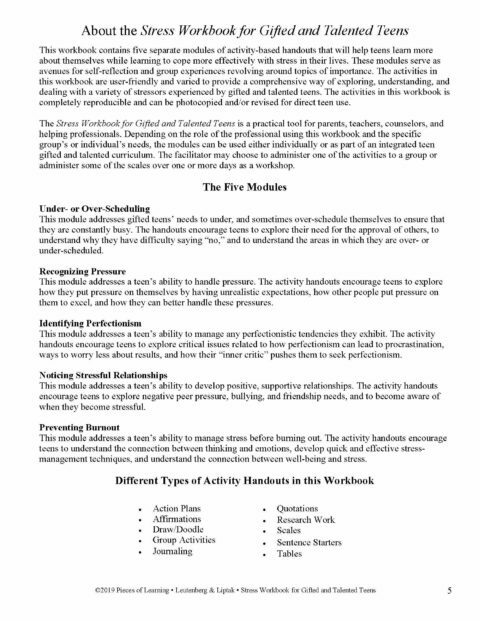 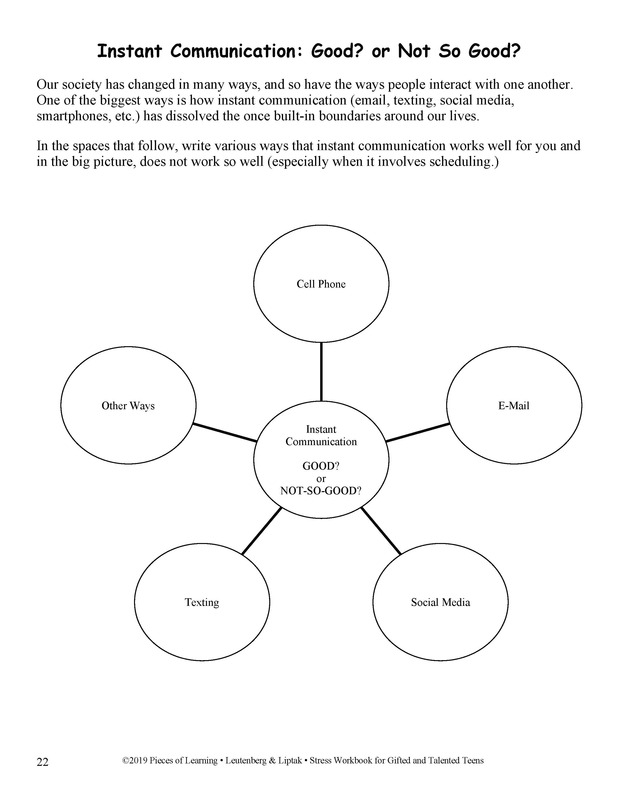 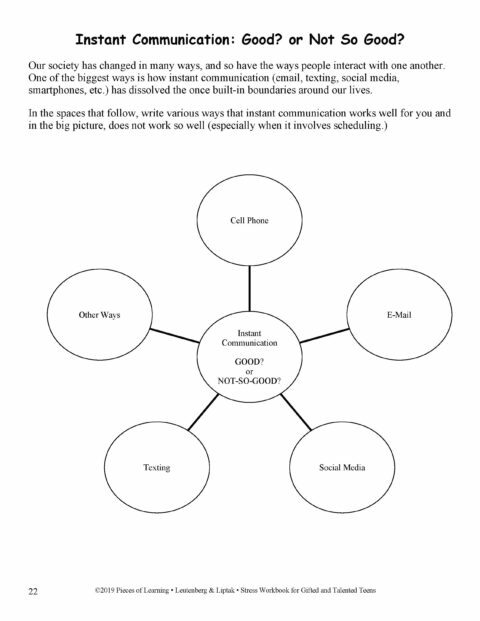 The facilitator may choose to administer one of the activities to a group or administer some of the assessments over one or more days as a workshop. John has many years of experience in providing counseling services to individuals and groups in a variety of settings including job training programs, correctional institutions, and colleges and universities. 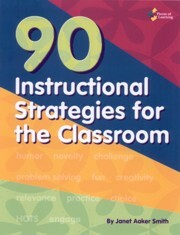 In addition, John has years of teaching experience as an assistant professor. 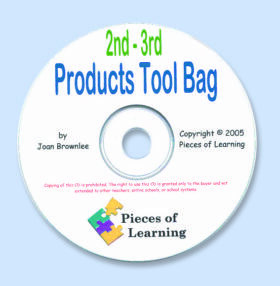 With Ester Leutenberg and Kathy Khalsa, he has written three other comprehensive books for teachers and counselors to use with their students and clients: The Self-Esteem Program, The Social Skills Program, and The Stress Management Program: Inventories, Activities & Educational Handouts. Ester RA Leutenberg has worked in the mental health field for many years as a publisher, author, and advocate for those suffering from loss. 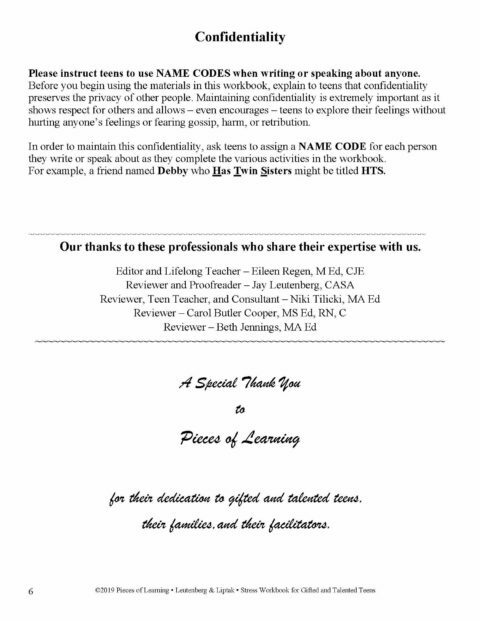 She personally experienced a devastating loss when her son Mitchell, after struggling with a mental illness for eight years, died by suicide in 1986. 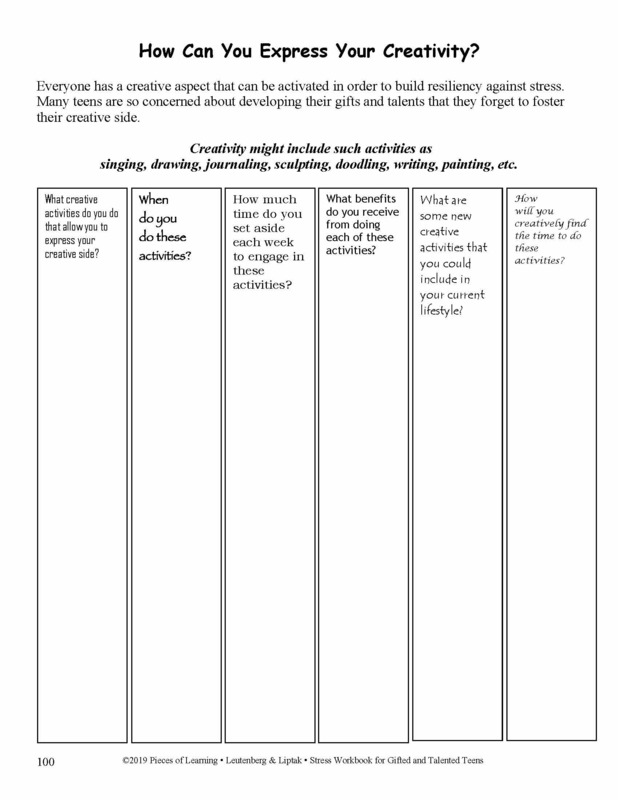 Soon after, as a way of both healing and helping others, Ester co-founded Wellness Reproductions & Publishing with her daughter Kathy Khalsa and began developing therapeutic products that help facilitators help their clients. Ester and Kathy are the co-authors of the Life Management Skills series for adults, SEALS series for teen-agers, and Optimal Well-Being for Senior Adults series, as well as a variety of other therapeutic card games, board games and posters. 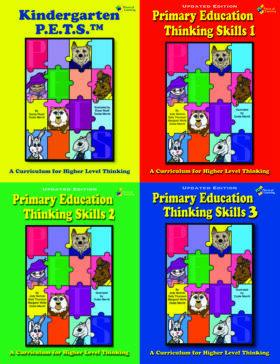 Ester has co-written three books and corresponding cards on GriefWork ~ Healing from Loss, and the following books and cards: Breaking Up is Hard to Do, Creating a Healthy Balanced Life, Complete Caregiver Support Guide, Life Skills to Help Teens Balance Way Too Much, Motivation, Veterans Surviving and Thriving, and the Traditional Life Skills for Teens Series.